Class Location: French Park on Medicine Lake in Plymouth, MN. From Interstate 494 (just north of Highway 55) take Rockford Road East (Rockford Rd is also named Hwy 9 or 42nd Street,) to French Regional Park. Enter the park and follow the road past the Visitor’s Center to Medicine Lake. At Northern Breezes Sailing Camp, youth ages 8-16 are introduced to the lifelong sport of sailing. Campers learn to skipper and crew a centerboard sailboat in light to moderate wind and sea conditions in familiar waters with supervision. Campers gain confidence, teamwork and leadership skills, as well as knowledge of water safety. There are three opportunities for instruction in a day camp environment. Our focus at each level is acquiring lifelong sailing skills, having fun while learning and empowerment of students with confidence and self-esteem through the safe operation of sailboats. To determine the best course, consider your child’s age, skill, and competitive nature. 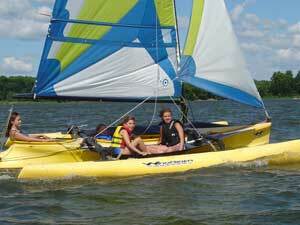 Camps are for children age 8-16 years with an interest in learning to sail. The emphasis is to offer a positive atmosphere for learning both sailing and life skills. Instructors help students safely expand their confidence through a series of small accomplishments and self discovery. Classes are offered in two age groups: The 8-12 year olds start with Walker Bay 8 Dinghies; they can then move to Walker Bay 10 Dinghies. Selected 10 to 12 year olds can move to WindRider 17 Trimarans. The 13-16 year olds start with Walker Bay 8 solos, and then move quickly to Walker Bay 10 Dinghies and on to WindRider 17 Trimarans. All levels of recreational sailing are taught here. American Sailing Association Basic Small Boat certification is available for dedicated campers who can pass a written exam. Racing is an activity which focuses students on the finer aspects of sail trim and sailboat handling. It is not our main focus. We want sailing to be fun, like an intramural sport. We are always happy to accept and work with parents or older siblings in a volunteer capacity. Feel free to call regarding the best choices for your children and other questions. Create unforgettable memories for your child. 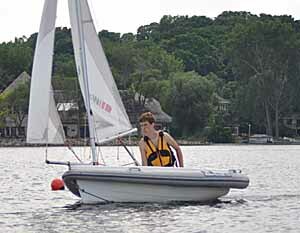 Dinghy Basic Sailing Camp is the ideal course for students ages 8-10 that have completed 2nd-4th grade. Classes run full days from 9 AM until 4 PM, Monday through Friday. Half day sessions are also available from 9 AM until 12 PM and 1 PM to 4 PM. Students learn using the American Sailing Certification System. On a typical day, our instructors lead short classroom discussions on the skills that will be covered. Building on that knowledge, instructors introduce land drills, where students learn skills in a safe and comfortable setting, making on the water sailing lessons more effective. Instructors arrange classes into three levels: Dinghy Basic Crew, Dinghy Basic Skipper and Dinghy Basic Solo. Entry level students begin as Dinghy Basic Crew sailing with Dinghy Basic Skippers. 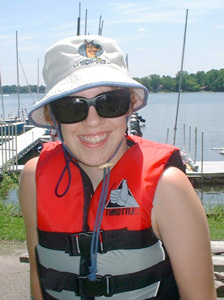 Eventually, students graduate to sail on their own as Dinghy Basic Solo sailors. Swimming, rowing and games are interspersed throughout the day in order to make this an awesome aquatic experience. We recommend students bring their own lunches, bottled water and snacks as well as a lifejacket, change of clothes and towel. A discount will be given to multiple week students: $15 off 1/2 Day sessions or $25 off Full Day sessions. Limit of 30 Students per Session across all three programs. Dinghy Advanced Sailing Camp is the ideal course for students ages 11-13 who have completed 5th-8th grades. Classes run full days from 9:00 A.M. until 4:00 P.M., Monday through Friday. Half day sessions are also available. They run from 9:00 A.M. until Noon and 1:00 P.M. to 4:00 P.M. Students learn using the American Sailing Certification System. On a typical day, our instructors lead short classroom discussions on the skills that will be covered. Building on that knowledge, instructors introduce land drills, where students learn skills in a safe and comfortable setting, making on the water sailing lessons more effective. Instructors arrange classes into three levels: Dinghy Advanced Crew, Dinghy Advanced Skipper and Dinghy Advanced Solo. Entry level students will be asked to solo on the smaller Dinghies, then progress to Dinghy Advanced Crew sailing with Dinghy Advanced Skippers. Eventually, students graduate to sail on their own as Dinghy Advanced Solo sailors. Treat your child to an exhilarating adventure. The WindRider 17 Sailing Camp is the ideal course for students ages 13-16 who have completed 7th-10th grades. 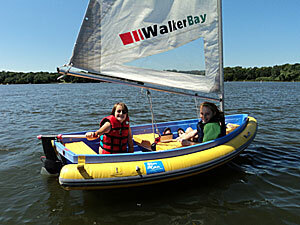 Younger campers who have completed Dinghy Basic or Dinghy Advanced are often introduced to these boats. Classes run a full day from 9:00 A.M. until 4:00 P.M., Monday through Friday. Half day sessions are also available. They run from 9:00 A.M. until Noon and 1:00 P.M. to 4:00 P.M. Students learn using the American Sailing Certification System. On a typical day, our instructors lead classroom discussions on the skills that will be covered. Building on that knowledge, instructors introduce land drills, where students learn skills in a safe and comfortable setting, making on the water sailing lessons more effective. Instructors are often aboard this boat to facilitate learning. Instructors arrange classes into three levels: WindRider 17 Crew, WindRider 17 Skipper and WindRider 17 solo. Entry level students will be asked to solo on the smaller dinghies before beginning as WindRider 17 Crews who will move on to be WindRider 17 skippers. This is a boat your graduate students can comfortably take you sailing aboard. Ages 14 and older may add certification in Basic Small Boat (ASA 110) for an additional $50. To register, please download and return the signed application form along with your course fee to Northern Breezes Sailing School, 3949 Winnetka Avenue North, Minneapolis, MN 55427. For more information or to have a form mailed to you, fill out the form below or send an e-mail with your name address and phone number to info@sailingbreezes.com or call 763-542-9707. Please fill out the following information so we can reply to your inquiries.